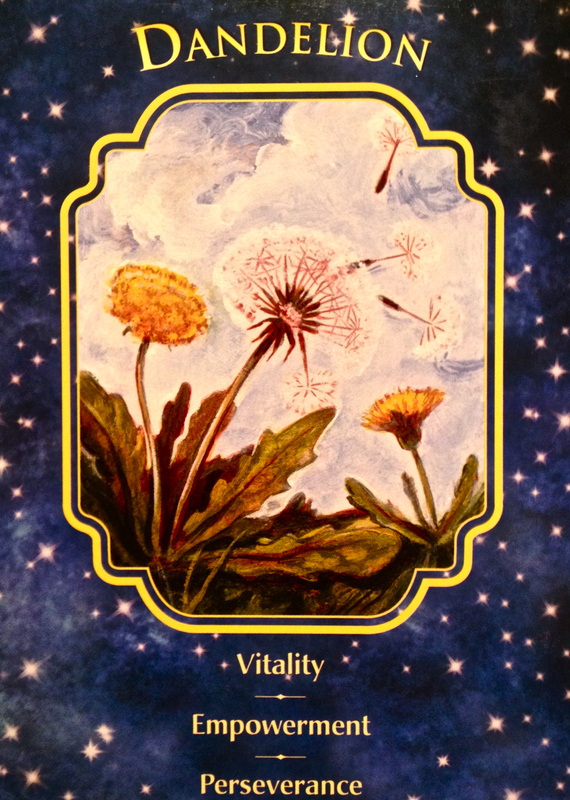 “Dandelion is here to empower you with vitality. Your wishes ad prayers have been heard. You will persevere. This powerful herb is helping you work through the layers of this situation by bestowing on you the qualities of strength, determination, and adaptability. This card is encouraging you to be strong and flexible. The dandelion grows with fierce determination. Although people mow it down, if finds a new way to survive, sometimes by growing through a crack in the sidewalk! Adjust what you can so you may continue to grow and reach for the light. Dandelions are considered weeds by many and powerful healing plants in the herbal medicine world. They have pesticides such as the highly toxic “roundup” targeted at wiping them out of existence and yet they are revered for a myriad of healing benefits ranging from liver tonic, to high calcium, iron and mineral content, skin care, and weight loss, among many others. They are versatile and determined, growing often in the worst conditions and yet almost impossible to eradicate if you really wanted to. Needless to say, they have quite the inspiring spirit! Be like the dandelion when you are going after what you want in life. Particularly in your thoughts. Don’t let anyone tell you that what you want isn’t attainable, isn’t valid, or is “just a weed”! Know that sometimes it is only our perception that messes things up. We have the choice to see things as “weeds” (negative) or powerful healing plants. We may not seem to have all the resources that we need to start a project; we may be stuck, feeling that we need to wait until everything is perfect before moving forward; but Dandelion is here to tell you that you can do this no matter who or what seems to be standing in your way. Dig down into your inner wisdom, strength, determination and adaptability. You are more resourceful than you think, and remember, the Universe always provides, particularly as you need what you need so that you can take steady action towards your goals. Spend some time with Dandelion, absorbing some of it’s vitality and allow it to empower you to move forward. It is no mistake that its flowers are bright yellow, the colour of the Solar Plexus Chakra. They are here to give you the confidence to move forward.